How to deal with resistance to change? When introducing new ideas in an organisation, we often face resistance. Having a structured approach for handling resistance can help to minimise risk and improve the chances of success. 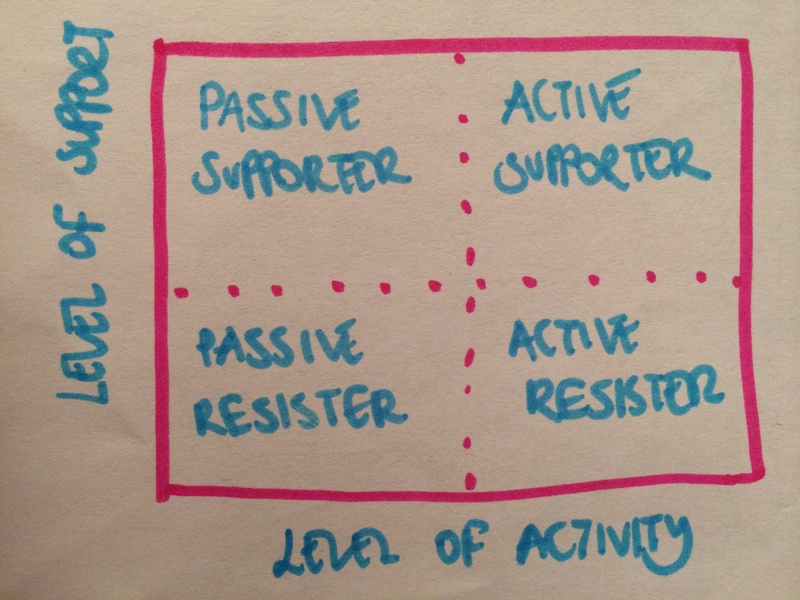 A method that I have found helps is to consider each of the main stakeholders based on a couple of parameters: whether they are supporters or resisters and whether they are more active or passive. 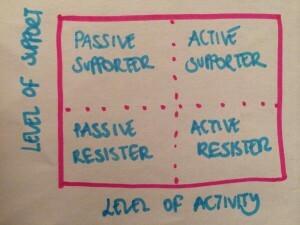 We can then use this to approximately place key stakeholders into 4 categories: 1) active resisters, 2) passive resisters, 3) active supporters and 4) passive supporters. These people are the “black hat” crew who will be negative, and loud about it. They don’t hold back their opposing views and they will happily tell anyone who cares to listen. The active resisters are of course easy to spot as they are the ones who challenge every detail in your concept. They take pride in spotting the holes and pointing out the potential pitfalls and why it’s not going to work. Their tendency is to get the microscope out and examine in detail, focusing on the exceptions and why the idea won’t work. The people tend to sit back and say little, but their body language tends to give them away. They may sit with folded arms, roll their eyes or simply sigh at suggestions for how to improve things. They tend not to speak up or disagree openly, but you can tell from their body language that they will not support the change. They are harder to spot. The biggest tell is that they don’t express any opinion, but they also don’t engage or take any action to support the change. These people also don’t say much, but they also don’t give off any hints that they are against it either. They tend to listen carefully to the arguments made by others and seem to be processing what they see and hear from others around them. These people are willing to give the idea a try, but might be too shy or reserved to promote it to others. They have a positive, hopeful attitude – but understand that there are risks and prefer to wait and see how things play out. These are the ones who can immediately see the benefits of the idea and are proactive in promoting the idea with others. They are great at warming others up to the idea and will often also supply you and others with relevant stories, anecdotes and arguments to help in convincing others. They cheerfully defend the idea and are not afraid to get in touch with resisters. These are the energizer bunnies that keep the idea going, taking the initiative and creating momentum whenever they can. I would strongly suggest that you focus most of your time in the early stages with the active supporters. The most important thing is to make sure these people have a good understanding of the change, why it matters to the organisation and why it is urgent. If you can, provide them with stories and material to help communicate the idea to others, and pair up with them whenever you can. You especially want to focus on the opinion-formers in the organisation – the ones who have respect of others. This is not always reflected in their rank or position in the hierarchy. It can be a good idea to provide frequent updates of progress to the active supporters to keep them informed, energised and “in the loop”. They may also be willing to help design and run experiments to test different aspects of the idea – perhaps even enlisting their team for this purpose. The active resisters on the other hand, need a different strategy. Don’t focus here too much, as these people can sap your energy and grind you down – but don’t ignore them either! One approach can be to identify just one or two of the active resisters who have the most respect and influence, but who you also know they have the best interests of the whole organisation at heart. You are going to leverage their black-hat negativity and use it to help address the most challenging questions and concerns. The objective is to strengthen your pitch and iterate on your idea. If you can draw one or two of them in to help you design ways to handle exceptions and mitigate risks, this can really strengthen the proposal. In my experience, I have seen a number of active resisters over time become some of the strongest and most active supporters. Because they have come from the position of initially being negative, they are not blind to the risks and challenges. Because they have been on a journey, eventually becoming convinced of the value of the idea, this typically makes them very good at convincing others – they can more easily empathise and identify with them. These are the two most important groups in the initial stages. Take all of the active supporters and combine with one or two active resisters and you can have a very potent mix. Don’t worry so much about the passive supporters or resisters. It tends to be that these people will mostly sit on the fence until they either see some results, or if they can see that the rest of the organisation is buying into the idea. Your efforts, at least initially, are better spent elsewhere. 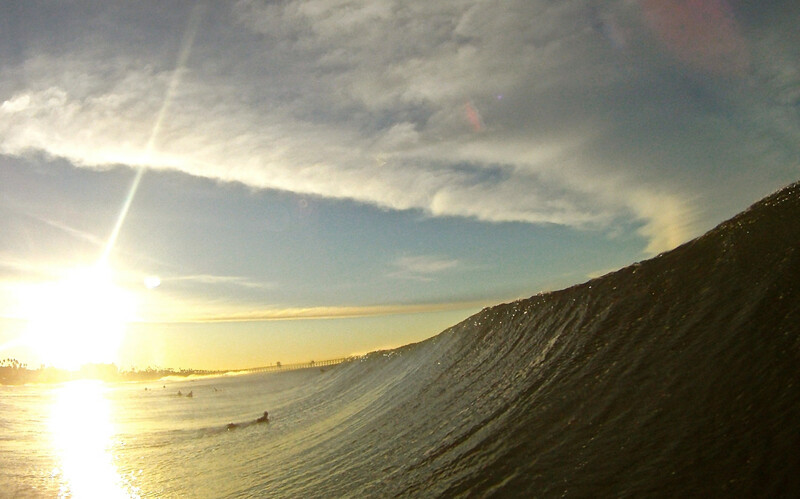 At some point, the amount of support for an idea will reach a critical mass. At that point it helps to have a plan for wider communication and training to take the whole organisation on the journey. ← How to influence decision making?